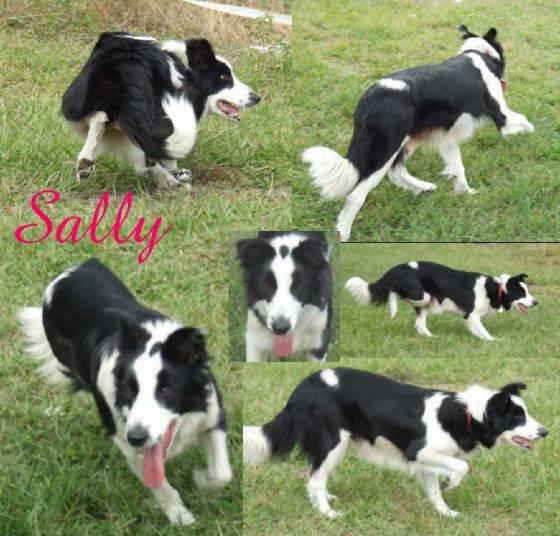 Sally is a pretty rough coated, black and white Tip-Eared female, with a dot on top of her head. She is a true workaholic with a fantastic personality. She is very reserved about her emotions but does get affectionate when no other animals are around. She is a great dog which will produce some pretty outstanding working puppies! Sally has a very nice pedigree, with Alasdiar Macrae's *##Imp. Nan ABCA 77943, as her grandmother! Nan won the International Supreme and has also won 4 USBCHA Finals National titles. To date, she is the only dog ever to accomplish this! Sally also carries the lines of *Imp. Ben ABC 77944, #Dryden Joe, #Mirk, and is line-bred ##Wisp on her top side! Where did we get Sally?? Originally Sally was purchased from Mike Canady, then sold to Loren Calhoun of Come By and Away Border Collies, then Sally was sold to Debby Jusick of Debby's Dogges, and now she is affectionately owned by us! Sally and Lad had a fantastic litter this past spring and Sally has taken a break from pups this heat cycle and will be bred to Lad this next cycle.